You may have heard the famous biblical story in Matthew 22:21. When Jesus was asked whether it was lawful for Jews to pay taxes to Caesar, he pointed to a coin and said Render unto Caesar the things which are Caesar's, and unto God the things that are God's. This was a trick question, and what Jesus gave was a trick answer. It could well be said that Jesus agreed that taxes should be paid, and that Israel belonged to God not the Romans. It would not be satisfactory both to the Jews nor the Romans. The Jews had much doubt on Christianity because what they saw was not commensurate with the Old Testament's prophecy of the messiah; especially Israel was not saved from the Romans and the Jews continued to suffer. This situation went on for over two thousand years. The first famous attempt of a logical explanation was by Aurelius Augustinus in about 400 AD. I read about him in the book A History of Knowledge last year. Augustinus, later St Augustine, wrote the book The City of God. He emphasized on the story of Caesar's tax and proposed the distinction of earthly wealth and heaven in two different cities: the City of Man and the City of God. Thus all the prophecies of the Old Testament could be said to be delivered in the City of God. St Augustine's thesis was the golden book of the Catholic church for many centuries. However, philosophers of all times were not satisfied with the explanation and the debate went on. When religion asked the faithful to prepare for the City of God, science could not find evidence of the City of God but consider the City of Man worthy of study. A recent development of the debate was NOMA. I read about it in The God Delusion. It was a recent proposition by Stephen Gould who was a paleontologist. On the relationship between science and religion, he proposed that these two are on two non-overlapping magisteria (NOMA). According to Gould, each "magisterium" occupies a separate realm of human understanding. NOMA principle is "the magisterium of science covers the empirical realm: what the Universe is made of (fact) and why does it work in this way (theory). The magisterium of religion extends over questions of ultimate meaning and moral value. These two magisteria do not overlap, nor do they encompass all inquiry." It is interesting to note that the NOMA principle came from a scientist. In reality, many scientists are religious from their upbringing. The fact that their scientific knowledge constantly disproves their religious belief is hard to bear, bordering on schizophrenic. In plain language, NOMA provides a seemingly scientific answer to not answering the quest to expose the religion delusion. Richard Dawkins wrote a long passage on NOMA. Among his many arguments, there were two that I found worthy of mentioning. First, he did not agree that science would be unable and should not talk about ultimate meaning and moral value. These have been the subjects of research in many branches of scientific studies. Many answers to some extent were found but work was still going on. Second, what were the abilities of religious gurus in providing answers to the ultimate meaning and moral value? So far, we have only seen man-made doctrines and rituals claimed to have such effects but they in fact did not. NOMA is an attempt to call a truce to the debate. This attempt is unnecessary as the debate goes both ways. Besides winning or losing in the war of words, the debate provides an on-going interest to the religion delusion for both sides. Any new scientific discovery could provide a moment of excitement of disproving a religious myth while religion would then drum up support and counter-arguments which could encourage more converts. I think NOMA works in another way. If god is symbolic of the unknown, then he resides in all areas that science is still searching for an answer. When science approaches, god would exist in a higher level of unknown, which is another magisterium yet out of reach. As such, earthly logic and reasons in our magisterium do not apply, and all logical reasons on the existence of god or otherwise are futile. An almighty god could not be bound by the human magisterium of emotions such as love, hate, envy, anger, revenge, reward, punishment, forgiveness and pity, etc. Any attempt to ask, beg, pray, worship an idol for anything good or bad is useless because god is in a higher magisterium which would or would not overlap with ours. May be Steven Cheung' books are out of fashion. I found this book selling at a nominal cost of $20. Steven Cheung said that it could hardly be called a book but rather a long paper. With a long prologue and a long epilogue, they marginally make a 93-page small book. The book may be small, but the idea is big. 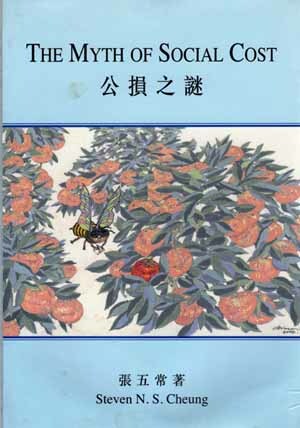 The title of the book is on social cost, while the Chinese title is social damage or social loss. The main focus of the book is actually on externalities. In economics, an externality is an impact, which may be positive or negative, on anyone not party to a given economic transaction. Social cost falls into this category when the society is not a party to the transaction. Social cost generally has a negative meaning. However, externality also includes social benefit. There is social damage only when the social cost is greater than social benefit. Externality is a subject made famous by Arthur Pigou. He advocated that externalities could be rectified by government intervention or taxation. Such kind of taxation, now known as Pigovian tax, is a tax levied to correct the negative externality of a market activity. A Pigovian tax may be levied on producers who pollute the environment to encourage them to reduce pollution, and to provide revenue to counteract the negative effects of the pollution. Pigovian taxes are sometimes called sin taxes, such as those on alcohol and cigarettes. Followed up by John Keynes, this school of thought led to the Keynesian economics which believed that the government should be responsible for shaping the economy through government spending and intervention. Steven Cheung, together with economists Ronald Coase and others in UCLA, Chicago University, University of Washington, and Virginia Polytechnic Institute and State University were on another route finding out the flaws in the Pigovian analysis. Their line of work was best known in the achievement of Milton Friedman of the monetarist school of economic thought. The book has a lot of mathematical presentations which are hard to understand. But the narrative part is eloquent in rebutting many illustrations of externalities used by Arthur Pigou and others. It adequately satisfies the aim of the book in exposing the myth of social cost. Pigou raised the case of the railroad through the wheat field as an example of externalities. He proposed that the railway company should compensate the owners of the wheat field because the cinder of the train would damage the wheat. However, upon investigation, the wheat production by the railroad was increased because the train scared away the birds which fed on the wheat. Another example was the noise produced by an airport as an externality to land price. The contrary was true because the land price increased owing to its proximity to the airport. Another famous example was the bees and apple farming proposed by Meade. He said that the bees collected pollens from the apple flowers and made honey, but the beekeepers did not pay anything to the apple farmers. Such externality should be regulated by a tax on bee keeping to compensate apple farmers. However, the truth was that bees collecting pollens also helped fertilize the apple trees. The force of the market was revealed from the fact that there were contracts between apple farmers and beekeepers on the rental of space in the apple farm for setting up beehives. Steven Cheung explained that the book was not meant to be used as argument against government intervention. The main point was that "application of economic theory must rest upon careful empirical investigation to ensure that the facts are true, that the hypotheses are testable, and that the tests are performed." John Burton, in the epilogue of the book, added a general conclusion for public policy, "Given the inherent defects, complexity, cost and bias of an intervention solution, the general rule should be to let the price system deal with externalities whenever possible. Government intervention, domestic or supranational, is best kept as a solution of the last resort. Even so, government intervention must be carefully scrutinized, because the costs and external side effects may outweigh the benefits. The mere existence of externalities does not provide a clear case for some kind of public intervention." Those in the government long enough would know the meaning of a joint office. It is meant to deal with matters which no one department is responsible for; thus a joint office is set up comprising staff of more than one department. It does not change the subject matters. They are still things which no one department is responsible for, or more plainly: no one is fully responsible. Worse still, a joint office could be the place where different groups of civil servant shed their responsibility. Instead of jointly responsible, they each have a reasonable excuse of not to be responsible. This typical bureaucratic practice is fully illustrated in the investigation report on water seepage problem published by the Ombudsman today. I heard the plan of setting up the joint office a few years ago and the background of the problem. At the beginning, EO were involved because HAD was one of the parties in the team owing to liaison work with private building management committees. HAD was very clever in not participating in the joint office owing to ignorance of technical matters. Actually the problem is not technical because the disputes are mainly between neighbours refusing to co-operate when the source of seepage could not be identified without entering private premises and knocking down some walls. Water seepage is a building maintenance issue in private properties. The government is dragged in and becomes a target of criticism because sometimes, but often not necessarily, the seepage could become a public nuisance, create building structural damage, or waste potable water. Major problems such as bursting of water pipes or drainage pipes would be quickly looked at by the premises owners. Only minor problems such as stained walls or minor cracks, which might not fall into the control of government, would blow up into complaints to Ombudsman. However, my sympathy does not go to the departments. A loosely made joint office is an example of the wrong side of bureaucracy. This is a good research subject of management science on team work and group dynamic.